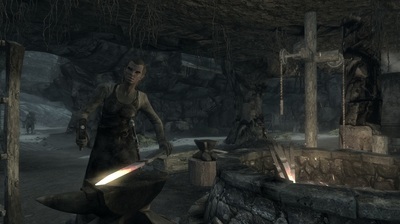 The gameplay objectives were to provide a quest-location, and a possible dungeon should the player be hostile to the inhabitants. Mor Khazgur as it stands in the original game. Five-minute mock-ups made in Maya using a basic background for the surrounding landscape. Initial development started with paperdesigns, making over fourty rough layout sketches to determine the division of the three classes, based on historical architecture as well as examples from fiction. From the original fourty, ten were selected to be made into rough, five-minute Maya mock-ups, allowing us to explore possibilities with miniatures. Mock-up 10 was used as a basis, taking elements from mock-up 1 and 6 to improve upon the layout. We also decided that the city should only house the two upper classes, the Slums being dug in beneath the actual city to form a Goblin-Town aeshetic. Development continued in the Creation Kit. Starting with the removing of old Mor Khazgur - For which the city was originally a replacement - and placing an asset-zoo to see what assets were available. This continued into making basic layouts in seperate levels to explore options before building the first playable greybox. 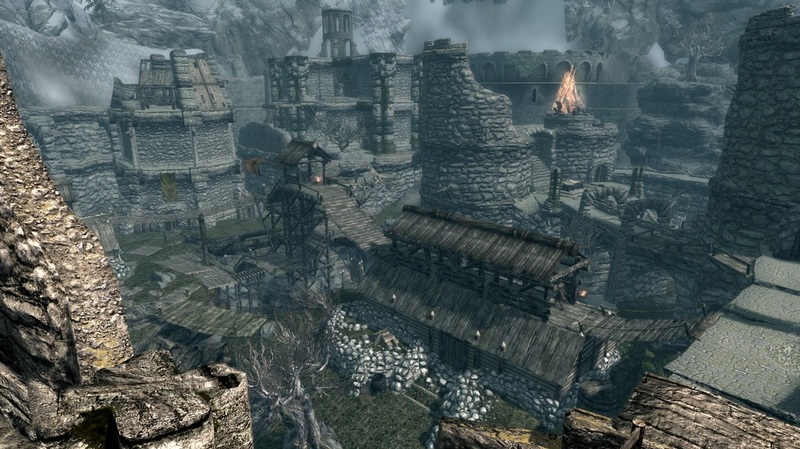 The first greybox suffered from the problem that it was difficult to make the fortress distinctly orcish and prototyping began on creating the underground slums to help define the aesthetics of the city. In the Creation Kit, all ground in a tile is a single mesh made of quads that can be elevated or lowered to form the desired groundfloor. It cannot be cut into, and it cannot be moved on any other axis. To make indentations into the ground the designer uses dirtcliffs, which can be angled to form fake ground at otherwise impossible angles. 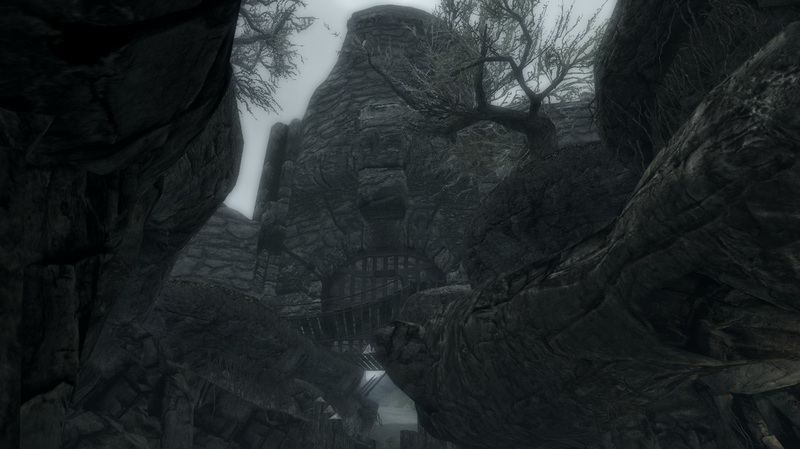 In order to make seamless, cavernous housing I used dirtcliffs as a core principle, using them to form a false overhang, using cave components to form a lower level that the dirtcliff can rest upon to form a wall that moves inward. 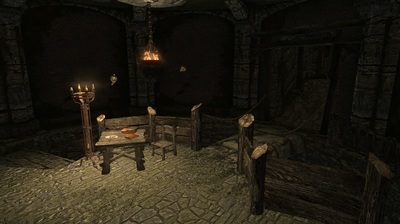 The actual ground floor slopes down long before the actual cavernous area, to prevent clipping. 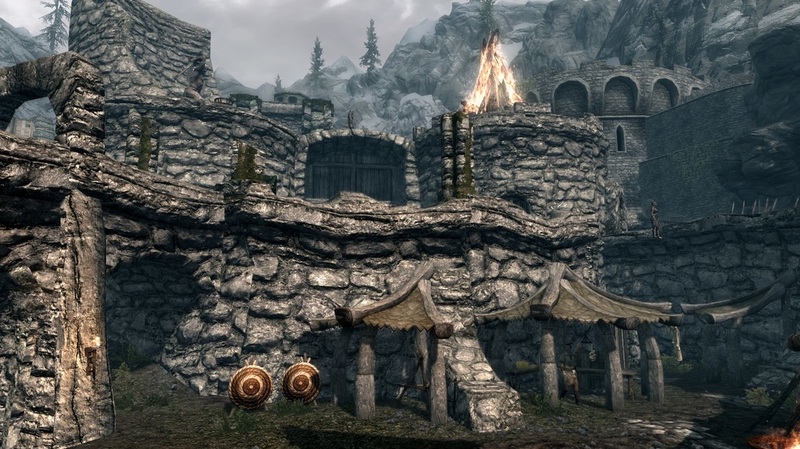 The resulting problem is that these overhangs were insufficient to create true housing, creating only an overhang of 4 meters at best, and stacking dirtcliffs to create more fake ground created ugly and obvious fake landscape on the ground floor. To resolve this issue, all larger buildings were placed above intended space for caverns, using the building's footprint to further hide the missing groundfloor. The map below (Img. 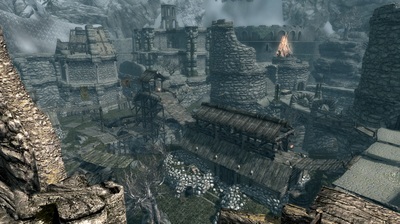 1), displays the layout of questgivers (triangles) and shops (stars). that come with the gratitude of the city. The number of entrances fluctuated between just one main entrance and four. The initial design had two entrances (Img. 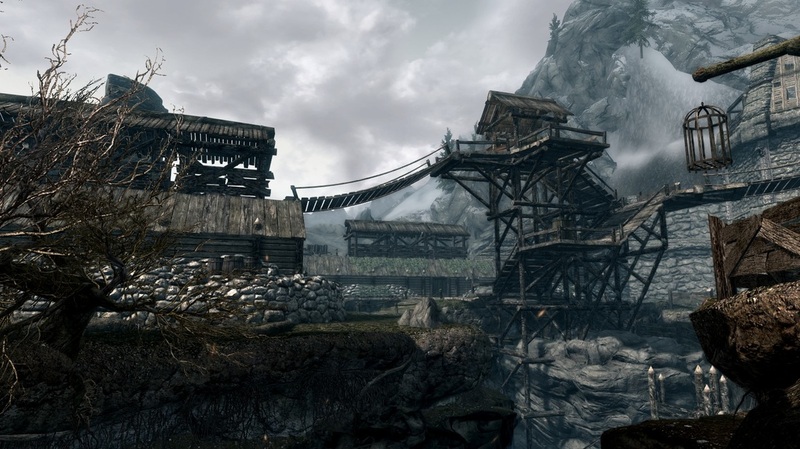 2), one on the south and one on the east, but was revised to a single entrance leading into the slums (Img. 3) on the south-eastern corner, as to have full control on the player's entrance and exit as done similarly in Whiterun. 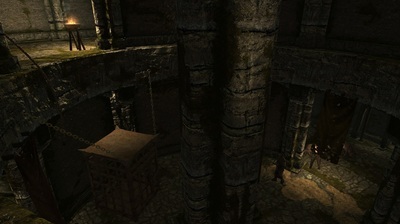 The single entrance into the slum was too cumbersome for frequent visitors delivering quests to the upper city, and so the south and east entrances were reintroduced (Image 4, in yellow) as quest rewards to use after gaining prestige within the city. Each also comes with a vendor for loot. One last request was to have access to the prison area for player-escapes, the visiting of an Imperial prisoner and for player rampages. A sewer was added to the rear-end of the wall at the far north (Image 5). 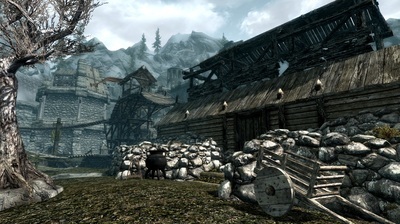 To ensure the player could easily - after earning the prestige - travel between different classes several options were added to move to the different layers of society. Image 6 to 8 mask each class seperate from the other two, and image 9 displays where the player can move up. 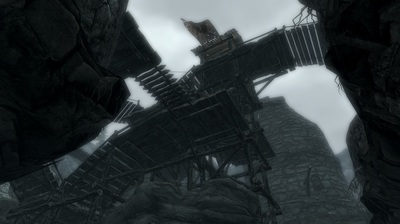 The player can jump into any lower level of society, assuming that the jump does not kill them. 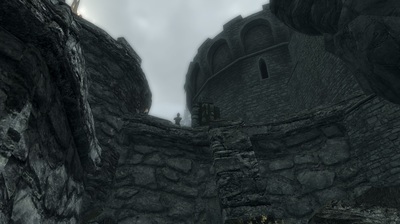 To help in player navigation an irregularly shaped tower was added in the center of the city. The tower is made of scavenged wood, and stands out as the only structure to be not made of stone to reach this height. The tower doubled as a mast for connecting the upper city and the city walls through rope bridges, and is the only position the player can move from the Slums to the Chieftain's Rise. Quest-design demanded the player always start in the slums. The gateway was therefore dug out to form a slope down into the lower city and the portcullis is lowered. Each colour represents a disrict that can be disabled if the player is in another district from where the player cannot see or hear it. Because of the increase of space we have an obscene number of units running in an area. Skyrim, natively, only runs about 20 units on screen, even during larger setpieces. We decided that, as a mod 4 years after release, we can up this number to 25 at the risk that some players that can play Skyrim cannot play our modification. This was still 15 characters short of what I needed to make the stronghold feel alive. 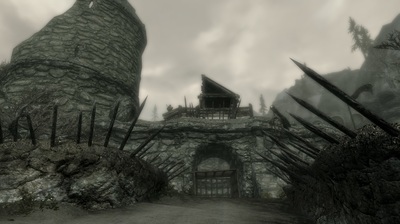 All guards are reduced to approximately one third of their required number, given a large patrol path that brings each guard through multiple districts and uses a multi-spawn. Multi-spawns will spawn a new character (Of limited quantity) upon trigger or death of the previous character. This reduces the maximum number of active guards we need at any one time, whilst still representing guards throughout the area. This came with the added benefit of not swamping the player during combat, but continuesly offering them people to fight. On entering a district a check is done: Any NPCs that run on the opposite side of the city and can therefore not be detected are despawned. On entering a district another check is done to see if any despawned units should be spawned again, starting in their monster-closet. 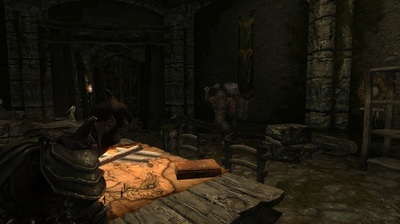 In case of a fight, despawns are halted to allow the player to kite. Combined with typical culling, this will sufficiently reduce requirements to run smoothly on most systems. Thank you for reading! And please contact me if you have any queries at all regarding my work.